Every year, General Plastics, through the Vision, Mission and Values awards, recognizes and rewards employees who personify our company values and demonstrates excellence every day. 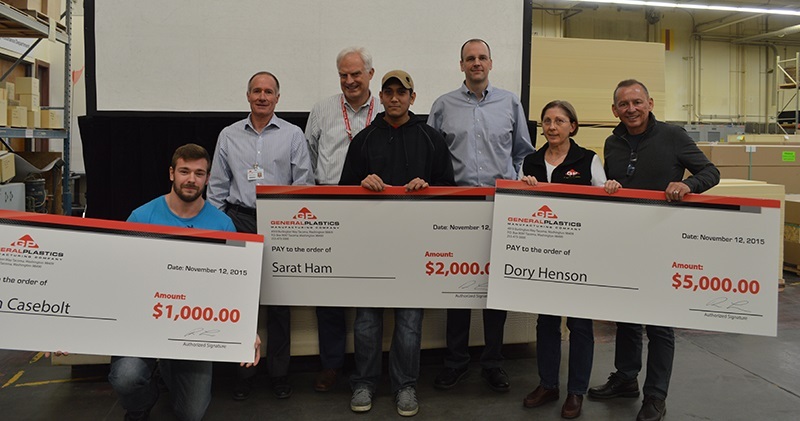 The 2015 Vision, Mission and Values awards went to Dory Henson, Sarat Ham, and Ryan Casebolt, respectively. The three awardees were selected because they each exemplified the spirit of General Plastics: Teamwork, helpfulness, work ethic, continuous improvement and the ability to work well with other departments. Henson is our Quality Assurance team’s Gap Seals, CNC, CAD, and first article inspection subject matter expert. She has been with the company for more than 27 years. Ham is responsible for shipping out all Plant 1 parts and production of ABS and Foam Comb parts. He has been with GP for 5 years. Casebolt, who has been with GP for more than 2 years, is a quality engineer who performs various tests on foams against different standards and ensures that they are acceptable to go into production. This year’s award program had the highest number of participation with 42 submitted nominations and 31 individuals nominated, nearly doubling last year’s. Those who were nominated demonstrate the initiative to learn and grow, and have relentless focus on customer satisfaction and continuous commitment to high standards of accuracy, professionalism, and timeliness. General Plastics’ Vision, Mission, and Values guide us on how we act and conduct ourselves with customers and each other. “These days, most companies have a vision, mission, and values and they put them on the wall, and that’s the end of it,” said VP of Sales & Marketing, Kirk Lider. Believing in the importance of what we do and working together towards the same goal fuels our focus on innovation and continuous improvement as a company. As a result, each and every General Plastics employee plays a vital role in the company’s success. “I don’t know how you can have a successful company without people working together. You have to have teamwork,” said Lind. According to Lind, teamwork, integrity, and passion are part of our core values and each one supports the other. Each of the nominees, including our winners, Henson, Ham and Casebolt, made extra strides in improving themselves, and in turn, General Plastics as a whole, contributing to the company’s mission to provide customers and employees with innovative solutions. Click to learn more about our Vision, Mission, and Values. Congrats to our 2015 winners Ryan Casebolt, Sarat Ham, and Dory Henson! L-R: Ryan Casebolt, President Bruce Lind, VP of Sales and Marketing Kirk Lider, Sarat Ham, VP of Materials Technology Mitch Johnson, Dory Henson, and VP of Organizational Development Eric Hahn.